The Fawcett Society, the women's rights charity responsible for those "This is what a feminist looks like" tees is currently investigating allegations that the shirts were actually made in sweatshop conditions on the island of Mauritius, where workers were paid 62p, about a dollar per hour to make the shirts. 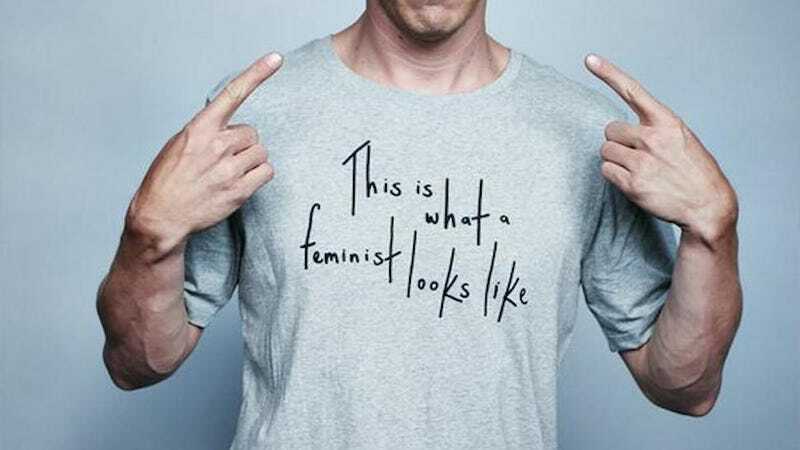 The shirts, a partnership between the Fawcett Society and Elle magazine are sold at Whistles and have been very popular lately, with political figures in the UK as well as celebrities (Benedict Cumberbatch) wearing the shirt proudly. But according to a report by The Mail on Sunday, the women workers who make the shirts are live in deplorable conditions. In the report, Ben Ellery visited one of the factories, writing that workers make 62p per hour and sleep in "spartan dormitories, 16 to a room." That's about $192 USD per month, $2,304 per year. It appears to be above minimum wage in Mauritius, which (according to Wikipedia) is $1050 USD. Not that it's a lot of money to live on in the first place obviously. To compare, last year Bangaladesh increased the minimum wage for garment workers to $68/month—a move that was met with protest from workers demanding at least $100/month. And recently, garment workers in Cambodia have demanded minimum wage be raised to $177/month. I mean, we can always stand to do more to ensure protection and better payment for garment workers. The figure is just a quarter of the country's average monthly wage, and around half of what a waiter earns. Each 'feminist' T-shirt costs just £9 to make, but high street chain Whistles sells them for £45 each – a figure it would take the women a week and a half to earn. "As a charity that campaigns on women's rights in the labour market, we have been concerned right from the outset of our collaboration with ELLE magazine that any products meet rigorous ethical standards. "Upon receiving samples of the range at our offices in early October we noted that the t-shirts had in fact been produced in Mauritius, upon which we queried (over email) the ethical credentials of the Mauritian factory, and the fabric used. CMT has Oekotex accreditation, which fully conforms to the highest standards in quality & environmental policy, whilst having world class policies for sustainable development, social, ethical and environmental compliance. Confident with Whistles' endorsement and CMT's credibility, the Fawcett Society went on with the collaboration anyway. "We have been very disappointed to hear the allegations that conditions in the Mauritius factory may not adhere to the ethical standards that we, as the Fawcett Society, would require of any product that bears our name. At this stage, we require evidence to back up the claims being made by a journalist at the Mail on Sunday. However, as a charity that campaigns on issues of women's economic equality, we take these allegations extremely seriously and will do our utmost to investigate them. "If any concrete and verifiable evidence of mistreatment of the garment producers emerges, we will require Whistles to withdraw the range with immediate effect and donate part of the profits to an ethical trading campaigning body.